Note that Asus will sell a Windows version of the eee next year, but that will probably be more expensive. This is the way to do it on the cheap! If you still want to run the thing in Linux, there’s also advice on how to add any program you want beyond the initial app list, as well as add a standard start menu and other tweaks. This thing is going to be the ultimate hacker’s guide. In a lot of ways it’s the Mac Mini done right. Thats’s almost a perfect distillation of the most-used hardware features. Note that there’s no hard drive, just a 4GB SSD disk. That cuts down on power and weight, at the obvious expense of storage capacity (but 4GB is plenty for basic office documents and such. You can’t expect to drop your Picasa or iTunes folders on here). The software stack is also strong – Asus worked with Xandros for a customized distribution and window interface, that comes preloaded with a very well-thought out list of preloaded apps, grouped into tabbed categories: Internet, Work, Learn, and Play (and Settings). The apps include Skype, Firefox, a universal Messenger client, Open Office, a media player, and shortcuts to Wikipedia and Youtube. If this isn’t enough, Asus does plan to introduce a Windows version in 2008 (presumably at a higher price point). In the end, the Eee PC is the single most impressive notebook we’ve seen priced below $400. 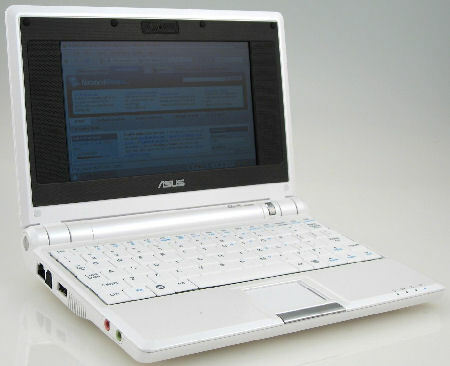 The technical specs might look sub par, but the usability and overall performance of the Eee PC rivals notebooks costing several thousand dollars more. Granted, you can’t install Photoshop on this little notebook and you can forget about playing Bioshock on this thing, but the Eee PC can do just about everything you â€œneedâ€ to do with a notebook while on the go. As it stands now, the Eee PC is a truly impressive ultraportable with a value much higher than the sale price suggests. 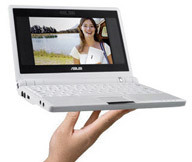 The Eee PC can’t replace a full-featured desktop or notebook, but it makes the perfect choice if you are in the market for an ultraportable notebook for school, work, or vacation. Note however that with three USB ports (more than I have on my Thinkpad T42, note) you can basically extend the machine’s capability in true flex computing fashion. In fact it makes sense for the PC to be as”light” as possible in a flex computing environment; just add a external graphics card, disk drive, DVD player, and a few other bells and whistles and you’ve got a complete workstation. The bottom line is that this little PC pretty much suffices for the vast majority of casual users who need a PC for travel, wireless internet access, basic office work, and managing media. And it’s tiny (2lbs) and cheap: $399 retail at Best Buy or online at New Egg.